Just as how a lot of people consider a car’s engine as a single thing, they think the same for other significant parts of a vehicle such as the transmission and the suspension. An engine is preferably made up of hundreds of different parts, all working together to make one unit which we call an engine. An engine contains pistons, valves, cams, shafts and lots of other components which work together. Similarly, the suspension of a vehicle includes many different parts, working together to make the suspension function. Out of the many parts a suspension has, one part that plays a crucial role is the control arm bushing. The control arm is fitted in the front end of the suspension, the part where the front wheels turn. This component is found at the back in some trucks. 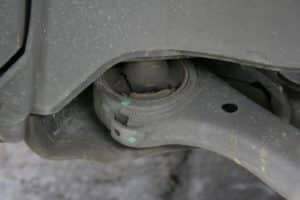 The control arm bushing is what connects the suspension’s front to the vehicle’s frame. There are two types of control arms: the upper arm and the lower one with a rubber bushing attached at its side. This rubber sleeve covers the two metal parts connecting, allowing them to make contact while not damaging each other. This rubber not only does that but also dampens a car’s vibrations from bumps and minor shocks. The effect of rubber softening and absorbing vibrations is better than springs considering where it’s situated. The rubber bushing also provides lubrication for the parts, as it contains the grease to ease the friction. The metal sleeve coming from the inside of the suspension is connected to the car’s frame with the help of a center bar. The outer sleeve attaches to the wheels at both ends, allowing both the sleeves at the ends to move independently of each other. Because of that, control arm bushing and the control arm it faces a lot of stress as the car moves and turns. Over time these bushings become hard and start to crack which can cause some problems. There are some different signs your car will show which can tell you that the car’s control arm bushing is going bad. You may experience a difference in comfort as well as the steering for the most part but there are other problems too which you might face depending on the severity of the damage of the control arm bushings. When a control arm bushing goes bad, you will feel a decrease in the comfort level as you drive. That is because control arm bushings soften the vibrations of the vehicle as you drive on roads, most of which are uneven. As you drive, you may get a lot of things on the road, from small rocks to other things lying. When your car rolls over the road debris, it doesn’t vibrate. The control arm bushings help to dampen the vibrations from these, making your ride comfortable. As the control arm bushings worn out, you may hear clunking noise as you drive, especially as you turn your car, making the driving experience rather unpleasant. While the control arm bushings don’t have a direct link to the braking system, it does affect the braking of the car. If the control arm bushings in a car have gone bad, the braking may not be profoundly affected but can get unstable at times, making the front end of the vehicle to rock back and forth due to inertia as the car tries to stop. This can lead to further problems in the future and due to the extra vibrations caused by this, other parts can come loose or even break off. As mentioned above, accelerating from a dead stop, you may experience that the steering is shaky and the front end of the car tends to shake and tremble as you turn the car or press on the breaks at considerable speeds. That is due to the control arm bushing being unable to lubricate the two connecting metal sleeves and also not being able to soften the play between the two pieces. Because the control arm bushing keeps the two metal sleeves nice and snug, when these go bad, the sleeves get a bit of play in them, moving and vibrating as the car moves. Since the control arm is connected to the front wheels via the outer sleeve, the movement in the control arm can interfere with the wheels, causing them to have less surface contact with the road than the other side, causing uneven wear on the front tires. The steering system connects with the wheels which are connected to the suspension via the control arms, which makes a direct connection between the steering wheel and the control arms. 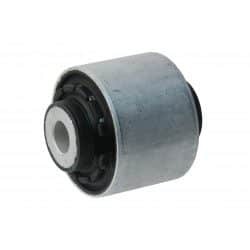 If your steering wheel tends to vibrate as you turn or brake, the culprit is likely to be bad control arm bushings because they aren’t softening the minor vibrations due to turning and steering as you drive. Replacing the control arm bushing or even the control arm itself isn’t a difficult task, considering that you have a bit of knowledge regarding cars and their suspensions. The control arms don’t go bad as often as their bushings, and it is advised to change the bushings every year. If you aren’t one of those who are comfortable with fixing your own car, then you can get your car to a mechanic to get it fixed. It can cost you anywhere from $150 to $400 including the labor cost. It also depends on the make and model of your car. It is advised to change the control arm bushings immediately as delaying the repairs can cause extra wear and tear of the suspension and its other parts. I’ve got a problem, which sounds as if it’s a bearing issue. The front tires are Pirelli, Cinturatos w/ 25k mi. and even wear. I replaced the inner/outers front bearing on my ’09 Mercedes E350 because of this bad sounding bearing. It does not get any more noticeable when turning left or right on a smooth surface. It is most noticeable when driving straight @ 20 mph (beginning at 5mph to its most @ 20, or so and diminished @ 35/40 mph. Beyond 40 mph, it really isn’t an issue. Wiered !!! Have re-adjusted the nut on both hubs multiple times (tighter/looser), even put a washer between the bearing and the gland nut and adjusted for play…no difference. Put the new Continentals from the rear to the fronts…no difference. Looked at the control arm bushing and they look ok…even put my stethoscope on the hup nut while rotating the wheel and nothing. So what the hell is going on ?? ?